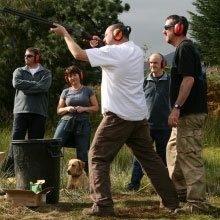 At Speyside Tours we will endevour to find the right activity for you to enjoy prior to your big day. From a gentle day on the golf course to an adventurous white water canoe trip we can offer a diverse range of fun and enjoyment. From small groups to larger parties we can arrange day time activities as well as evening entertainment. Simply let us know the size of your party and choose from the list of suggested activities and let us do the rest? You need not limit yourself to a single activity as a programme of events can be arranged for your enjoyment. A very popular activity to date has been the MINI HIGHLAND GAMES, yes you get to try tossing the caber, tug o' war and throwing the hammer - GREAT FUN. Suggested activities ; Golf(tuition/clubs available), Whisky Tours, Mountain biking, Paintballing, Rock Climbing, White Water Adventure, Hill Walking, Archery, Highland Games, Evening Entertainment, Off Road 4x4, Quad Biking, Fishing, Whisky Cocktail session, Shooting, Whisky Dinners/Whisky Tastings or a session of local craft.